Delight in the sound of your voice as it connects to impulse and resonates freely through your whole self! Feel the vocal power that comes with efficient breathing and grounded skeletal support. Learn a system of voice awareness employing The Feldenkrais Method® and Linklater Voice work. Each lesson develops kinesthetic awareness to identify and clarify the function of the larynx, tongue, jaw, face, pelvis, spine, head and diaphragm. 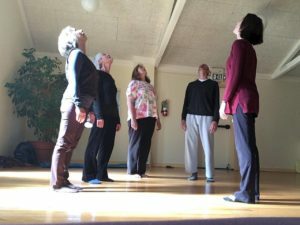 Drawing on decades of somatic training, dance and theater, Song offers a unique embodied sound and movement experience, integrating the Feldenkrais Method®, Linklater work and vocal improvisation. The class is open to singers, actors, teachers, public speakers or for those simply looking to enjoy and/or improve the quality of their voice. No previous experience necessary. Copyright © 2019 Song Nelson. All rights reserved.